If you loved DVST8 White Cut, you're going to thoroughly enjoy DVST8 powered by Dynamine. 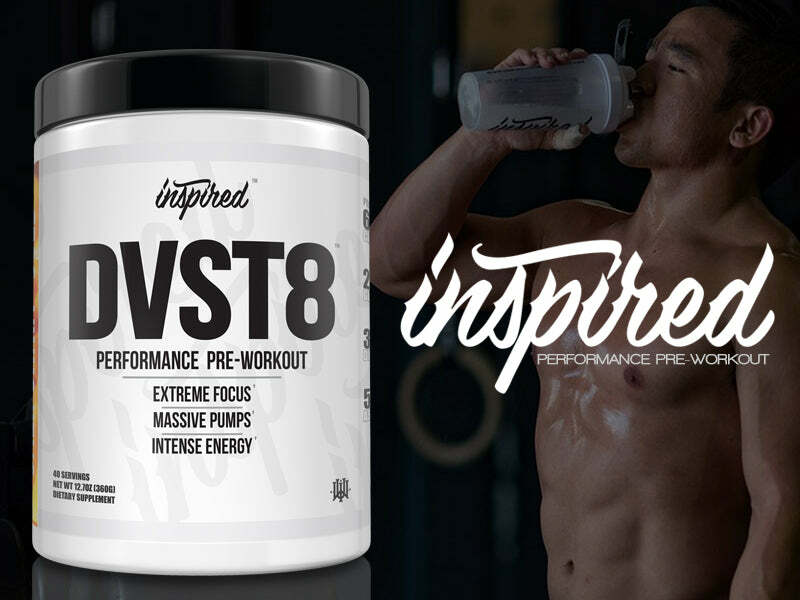 Here is a run-down of the ingredients that make this one of the most powerful pre-workouts to date. L-Citrulline: L-citrulline is a free-form amino acid that enhances nitric oxide, as well as blood flow, by increasing ornithine and arginine plasma content in the blood. Citruline increases blood flow more efficiently that arginine supplementation. L-citruline supplementation also results in reduced fatigue and improved endurance for both aerobic and anaerobic prolonged exercise. Beta Alanine: Beta alanine is a precursor to carnosine, an acid buffer within muscle tissue. Supplementation with beta alanine increases endurance and work capacity as well as increases time to exhaustion. Glycerpump: Glycerol has a hydrating effect that not only prevents dehydration, but endures a state of super hydration as well. This super hydrated state leads to enhanced endurance and work capacity by increasing the amount of time that you can train before entering a state of dehydration. L-Taurine: Taurine has multitude of effects that benefit athletes prior to workouts. Taurine directly increases blood flow to working muscles, thus delaying fatigue and increasing work capacity. Taurine also increases the rate of fat oxidation during training, leading to more calories from fat being burned per exercise session. Caffeine Anhydrous: Caffeine is desirable due to its role as an adrenergic agonist. This means caffeine stimulates the production of epinephrine (adrenaline) for increased energy, mental focus, and delayed time to exhaustion. Caffeine also increases the production of neurotransmitters that promote improved mood and sense of well being. Methylliberine (Dynamine): A naturally occurring constituent of kudcha tea, a novel, next-generation nutraceutical, Dynamine is a derivative of caffeine that crosses the blood brain barrier more efficiently than caffeine. Dynamine has a longer half-life than caffeine due to its ability to efficiently block adenosine receptors, increasing circulating adenosine. This is key because the body responds by releasing more epinephrine, leading to a longer lasting energy with no crash. Dynamine is also cholinergic, that is, it increases acetylcholine production in the brain. In this manner, Dynamine enhances mental focus, memory, and cognition. N-Phenethyl Dimethylamine Citrate: N-Phenethyl dimethylamine citrate is an extract of eria jarensis, an orchid that is native to South East Asia. It provides powerful mood-boosting, euphoric effects due to its ability to increase dopamine, a neurotransmitter responsible for enhancing focus, concentration, and sense of well being. Theobromine:Theobromine is a xanthine compound that is present in cocoa beans. It's one of the reasons why chocolate is said to improve mood. Studies indicate that it does indeed enhance mood, boost mental focus, and energy. Theobrimine also augments a pre-workout well due to its ability to dilate blood vessels for better blood flow, and widening of the airways for enhanced respiratory function. INGREDIENTS:Silicon Dioxide, Natural Flavors, Sucralose, Citric Acid. Mix one serving (1 scoop) per 4 ounces of water 30-45 minutes before workout. Do not exceed 2 scoops in a 24 hour period.